Hey hey! Taking a break from my blogging break with an alien interview. Anyhow...libraries do rock don't they? Thanks for sharing your find. I will be sure to check it out. As for finds while browsing-most recently it was something I shoulda been familiar with but was not...Edgar and Allen Poe! Middle Grade mystery and twins in it too...gothic and fun! Libraries are wonderful, Deb! I'm so happy to have rediscovered that. I've heard of that book about Edgar and Allan Poe, but haven't read it. Oh!!! This sounds like a must read. Yay for browsing! Glad you found something worthy. Browsing is rapidly becoming a lost art. I can't remember the last time I just browsed through the library. I usually just run in and pick up my holds. I'll have to make time to do some browsing. This book sounds like a fun one. Thanks for the review. I remember seeing this one and wanting to love it but... not? Apparently, it seemed too young for my students. Personally, I want to travel back to about 1977! Have fun on your vacation. Oh, this would definitely be too young for your readers, Karen. And revisiting 1977 would be fun. Or ghastly, depending. That was the year I graduated. I don't do enough browsing, but then I usually have two small children with me, so if I take my eyes off them, I lose them! Good luck with your revisions and have a great vacation! Thanks, Michelle. And I well remember those days, when all I did was chase after two young boys, with no time to think my own thoughts. It will get better! I love browsing... whether libraries or bookstores. It's a great way to spend an hour, isn't it? Thanks for stopping by, Sue. This sounds like a fun book. I love browsing! Glad to hear it, Janet. Discovering a fun book I'd never heard of is what makes browsing so worthwhile. I've always loved browsing at the library and learned of some of my favorite authors like Maggie Stiefvater and Cinda Williams Chima that way. Sadly with my reading schedule for the blog, I have not many times where I can browse. Maybe when I'm between jobs next year. That's so cool that you found those two amazing authors that way. Well, now you have something to look forward to when you have time next year. I agree! I love browsing...but it leads to my binging. I love libraries because my binge is guilt free. This book sounds like a lot of fun. Would it be good for girls who read When You Reach Me? My daughter loved that book. I never thought of it that way before, Brooke! Guilt-free binges. Libraries are great. And to answer your question, this book is definitely aimed at a younger audience than the publisher claims. I'd say it's best for 8, 9 and 10. When You Reach Me has a much more complicated plot. But if she likes time travel and is looking for an easy summer read, I'd say go for it. I love browsing in libraries! I'm a regular and drop in every week. The coolest thing is when I see some of my students (or former students) reading there! Good luck with your blog break -- I hope you get lots of writing done! I only manage to get to the library once every three weeks, because that's when the books are due! :) That must be fun to see your students and former students. Good luck with your writing! Browsing is the best, isn't it? Especially in the library where you can check out as many as you like! I think that's why I love libraries so much. No limit, plus it's free! Have a wonderful blog break. I hope you get lots of writing and editing done and have a wonderful time in Maine. Thanks, Jess. And yay for browsing! This looks like a cute read and I enjoy time travel tales. Have a fantastic blog break. I love the cover of this book. I have it on my TBR list now. Thanks. Best wishes on accomplishing all you want to do during your blog break. I love browsing in libraries. Used book stores, too, but there is something magical about browsing around in a library.The atmosphere is so special. I have discovered so many good reads that way. One of them was the delightful series, The Hall Family Chronicles (8 in the series so far), and one of them, The Fledgling, was a Newbery Honor book. She also writes a mystery series for adults, featuring Homer Kelly. One of those, Emily Dickinson is Dead, received a Nero award. 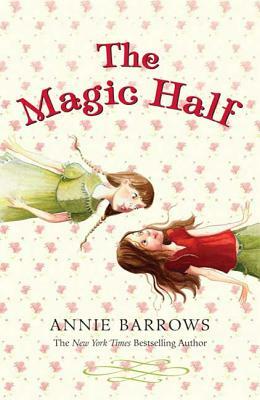 I love the sound of The Magic Half, and the book cover is charming, and I love time travel.